For Bruce Lee, a vital difference existed between strength and power, and this difference involved much more than semantics. He defined strength as “the ability of the body to exert great force”. Power, on the other hand, Lee defined as “the ability to release an explosive force to produce a quick, sudden movement to move the body with maximum effort”. He also stated that “power involves the rate of speed at which the force is expressing itself”. 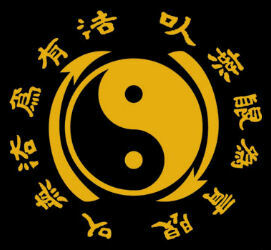 In other words, power was the marriage of strength and velocity, and a considerable amount of each had to exist if great power was expected to be unleashed within a given martial art technique. 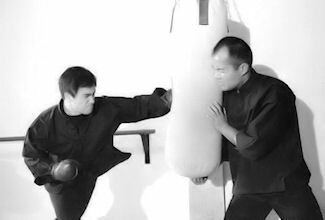 One of Lee’s students, Dan Inosanto, recalled Lee once asking him, “Can you tell me the difference, Dan, when I say that this guy is a strong martial artist and this guy is a powerful martial artist?”. Inosanto paused before he replied, “I don’t know, what is the difference?” Lee’s response was: “A man can be strong, but if he cannot use that strength quickly, he is not powerful.” Lee’s response is physiologically accurate. 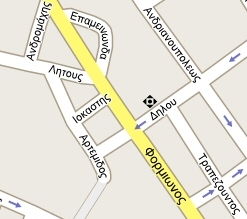 I was living on Tower Road. It was kind of a Spanish style place that had a patio and Bruce and I would train out there. Anyway, Bruce brought over this big, heavy tackle bag, football players use them a lot. We hung it up with a big iron hook and used it for practicing our side kicks. So I was flicking away with a kick and Bruce said “You’re too fIicky-fIicky! You’ve got to become involved in the technique!” When punching, he said, “Always lead with the little finger-pow! It goes out there!”. Anyway, he was saying, “Okay now, this is the way to do it,” and he kicked this bag, which must have weighed between 100 to 150 pounds. Well, he actually kicked a hole in the middle of it! He broke the chain that was supporting it, and it went flying out into the lawn. I remember that it was filled with rags and there were rags everywhere! I must have been picking up rags for months around there all over the lawn. It was really an astounding thing to see. One of Lee’s favorite pieces of training apparatus was the heavy bag. The heavy bag is not particularly exotic; it typically weighs 70 pounds and can be found in many fitness facilities and, of course, in every boxing gym. 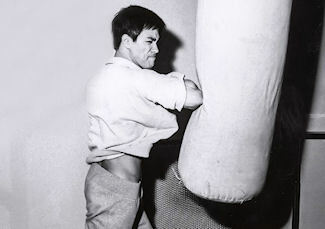 For Bruce Lee heavy bag bag training was a must, Lee could work seriously on improving the devastating power of his striking and kicking techniques. Building strength through weight training was one thing, but being able to have your body apply power in the right amount and at the right time was another matter and required special training. 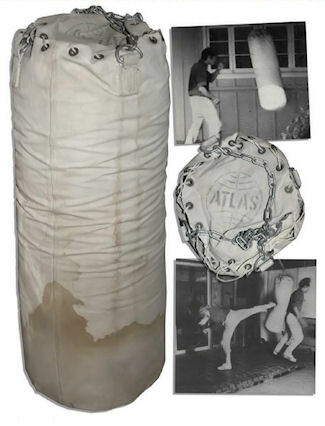 Although Lee later cautioned against excessive use of the heavy bag, he still considered it an essential component of his power, training regimen. To those just beginning to train with the heavy bag, Lee offered the following advice: “Start with 3 sets of 50 repetitions of each type of punch, then put them together in combinations. Then work in your kicks individually, then in combination. Finally, work in your hands and your feet in combination.” Lee also advised the user to wear bag gloves and/or tape the hands and wrists to prevent injuries and to receive proper training advice on proper techniques on heavy bag training. Besides your conventional bag weighing approx 70 pounds Bruce Lee was given as a surprise gift from Bob Wall, himself a champion martial artist and a co star in several of Bruce lee’s movies a special custom made 300 pound bag. According to several Bruce Lee biographies Bob Wall had to put the top down on his convertible to surprise Bruce since it would not fit in the back seat or trunk of his car. Dan Inosanto and others have said Bruce Lee was the only one who could kick this bag and make the whole hoses shake, others who tried could barely make it move. This heavy bag workout is actually a series of drills. Bruce would often mix them up, but always perform the first drill and then add another 1 or 2. So although there are many drills here not all are done on the same session. They are just picked for your punching days when you have to work the heavy bag. If you keep tabs on which drills you have done on the heavy bag, you can ensure you train all punches in time on the heavy bag, even if it takes a few weeks to get them all done. This is not all the combinations that Bruce performed, but these form the most important combos for boxing training. Remember, high means a head shot and low means a body shot. So when training do not swing your arms about your head height or below your waist line. Aim for your imaginary opponents ribs and solar plexus on the low shots. In addition to performing these routines over and over on the heavy bag Bruce also would add in feints, so for some initial attacks he would perform a feint and not jab, then perform the subsequent strikes. This trains you to still strike with force when you are not rebounding from the original strike. It is important to learn that sometimes you miss and when this happens your momentum is easily thrown off-balance. It is also a way to improve your feints. 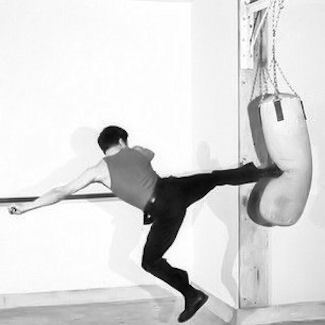 This is really just the tip of the iceberg of Bruce Lee’s punching training. In addition to the routines mentioned above he incorporated many strike routines into the stepping training. Also in addition to the standard weight training he performed isometric exercises to strengthen his punches, such as isometric upper cuts and hooks. This type of training is rarely seen in martial arts gyms today. What is most revealing when looking through Bruce Lee’s training journals is the sheer volume of training he performed. He was truly dedicated to training.